Neighbors | Submitted .Eight Canfield students qualified to compete in National Speech and Debate tournament in Florida in June. Pictured are the finalists, from left, Michael Factor, Taryn Rothbauer, Gregory Halley, Dominic DeRamo, Eva Lamberson, Jared Cross, Jennifer Smith and Dominic DuPonty. Eight students from Canfield are headed to the 2018 NSDA National Speech and Debate Tournament in Ft. Lauderdale in June. The Canfield speech and debate team competed at National Qualifying, the NSDA Northern Ohio District Tournament, hosted by Poland Middle School on Feb. 16-17. The following students qualified during this tournament: Jared Cross in Humor, Gregory Halley in Informative Speaking, Eva Lamberson in Lincoln-Douglas Debate, Jennifer Smith and Dominic DuPonty in Public Forum Debate, Taryn Rothbauer and Michael Factor in Public Forum Debate and Dominic DeRamo in United States Extemp. 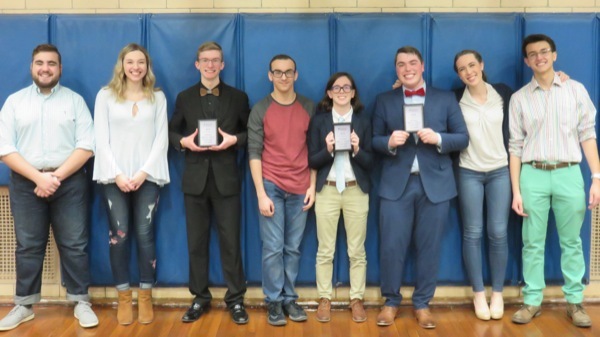 Canfield students earning recognition for their performances at the NSDA Northern Ohio District Tournament were Jared Cross (second place) in Humor, Gregory Halley (second place) in Informative Speaking, Eva Lumberton (first place) and Jessica Lee (third place) in Lincoln-Douglas Debate, Jennifer Smith and Dominic DuPont (first), Taryn Rothbauer and Michael Factor (second place), Marina Campos and Audra Pesko (third place) in Public Forum and Dominic DeRamo (first place) in United States Extemp.